Deciding early on to use off-site construction methods may also be impractical for some types of projects. While many health care facilities are making use of prefab components such as overhead corridor racks, bathroom stalls and patient-headboard assemblies, some spaces built around specific types of equipment don’t lend themselves to standardization. Given the long lead times associated with these types of projects, says Rob Taylor, president of Birmingham, Ala.-based Brasfield & Gorrie, “there’s a concern that the technology will change” in the interim, minimizing the potential benefits of prefab. 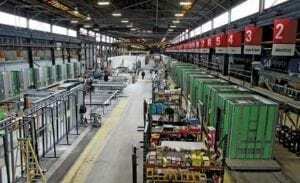 example, Skender described an upcoming publicly funded building project that would have been well suited for modularized construction delivered by his firm’s new manufacturing arm, which includes a southwest Chicago facility dedicated to those operations. Skender contends that the off-site methods would have helped to accelerate the project’s schedule, a proposition that might have appealed to many private-sector owners. But given the funding structure of the public-sector project, Skender adds, the owner could face penalties for early completion. “That means the project has to be done the old way,” he says. Overcoming such statutory and regulatory barriers may be a long and difficult process, observes Sabine Huynen Hoover, FMI’s content director and co-author of the owner study. The “tipping point” comes, she says, as more contractors develop expertise to perform off-site construction and owners become more aware of the downsides of conventional methods. But Chris Giattina, CEO of BLOX, a Birmingham, Ala., design-manufacture-construct firm, emphasizes that off-site construction represents a bigger paradigm shift on the owner’s part than integrating design and building services. He notes that off-site construction is achieving the biggest success among “serial builder” owners with a significant amount of work or those seeking to drive out waste. Dave May, president of Roeslein & Associates Inc., St. Louis, which specializes in design-manufacture-construct projects for the beverage industry, says that realization may come sooner for some owners than others. Skender cites recent productivity studies (“Improved Productivity Requires New Management Mind-Set,” ENR 2/13/17 p. 22) for influencing his firm’s strategy to acquire design services. “To make modular and off-site construction work, we had to have more control over the design,” he says. Eliminating barriers between design and construction results in a product-delivery approach that Skender expects will become more appealing to owners. Hoover notes that contractors shouldn’t feel pressured to become immediate experts in off-site construction, particularly if they’re not seeing a strong pull for those methods from owners. Alliances with product manufacturers provide ideal opportunities to exchange expertise, she says.